Imagine thousands of people gathered at a popular park for an outdoor music festival: They are crowded together, distracted by the music, and unaware of their surroundings. Imagine the park is in a downtown urban area—one of the largest in the country—and bordered by skyscrapers filled with people working, shopping, and cooking dinner. The park is a major tourist attraction and holds baseball diamonds, tennis courts, and three museums within its borders. The park is packed with people even in the areas not fenced off for the concert. Now imagine that a dirty bomb goes off in the park, without any warning. The DuPage County Health Department in Illinois was asked to do just that recently when NACCHO staff conducted a tabletop exercise that tested the health department’s ability to provide public shelters in the face of a radiological incident. 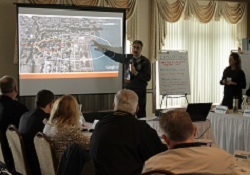 NACCHO developed the basic exercise scenario—called “Operation Safe Haven”—and health department staff, along with numerous local partners and responders, convened for the day to tackle the incident through discussion and collaborative problem solving. Throughout the exercise, NACCHO staff added new developments, complications, and challenges to the scenario, forcing players to alter their responses mid-exercise. Such a structure mimicked a real life event, in which first responders would adapt knowledge gained through previous trainings and exercises to respond to immediate needs during an emergency. The scenario, which incorporated not only logistical issues, but communication and coordination issues as well, asked players to navigate a situation in which the public would be fleeing from a metropolitan area—in this case, Chicago—and seeking shelter in a suburban one. Players were responsible for determining how to establish long-term shelters and immediate decontamination procedures with little warning, initiate screening and tracking plans, handle radioactive material, manage media requests, and monitor social media. A number of participants joined the DuPage County Health Department in the exercise, including the DuPage County Office of Homeland Security and Emergency Management, the coroner’s office, sheriff’s office, DuPage County Chiefs of Police Association and Fire Chiefs Association, American Red Cross, Salvation Army, Benedictine University, Illinois Emergency Management Agency, Illinois Department of Public Heath, Illinois State Police, the Federal Bureau of Investigation, and the U.S. Department of Energy. “It was gratifying to be able to bring together so many agencies to ensure we are prepared to protect the health and safety of our community during all types of public health emergencies, including radiation catastrophes,” Karen Ayala, executive director of the DuPage County Health Department, stated in a press release. The exercise was part of a national effort initiated by NACCHO, with support from the Centers for Disease Control and Prevention, to help support local health departments (LHDs) in their radiation preparedness planning. Radiation use has increased in the 21st century; a radiological emergency could displace millions of people and overwhelm public health, emergency response, and healthcare systems, even in communities far from the site of the incident. NACCHO will facilitate a second radiation preparedness exercise this May in Cobb County, GA. The scenario will be different in order to suit that particular community, but the structure will be much the same: NACCHO will design a radiological incident intended to test the capacity and functions of the LHD and local emergency responders. Tabletop exercises are only one feature of NACCHO’s ongoing commitment to radiation preparedness. NACCHO recently partnered with the Radiation Injury Treatment Network (RITN) to provide seven LHDs with funding to attend the 2015 Preparedness Summit and to participate in a new radiation workgroup. In turn, RITN is hoping the partnership opens up channels with LHDs and local responders. The majority of the organization’s current collaboration is done in the hospital and healthcare setting, but it hopes to foster strong partnerships with public health in the future. NACCHO hopes that by developing partnerships with other organizations and facilitating exercises of these types, it will eventually be able to develop a radiation tabletop exercise template that LHDs can use as a resource to advance their own preparedness efforts. The DuPage County and Cobb County exercises will function as pilot exercises, allowing NACCHO to work out structural details and determine the best process for a successful exercise. Once finalized, LHDs should have access to a step-by-step guide that walks them through the tabletop execution and strategy but allows for development of their own specific scenario. For more public health preparedness news and information, visit NACCHO’s Preparedness Brief blog. This entry was posted in preparedness on March 20, 2015 by nacchovoice.